Online grocery shopping for Norton Sound residents! 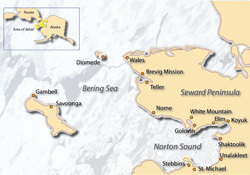 The Norton Sound Seafood Center is a retail store located alongside our processing facility in Nome on the Bering Sea. If you are in Nome, visit us from 9am to 6pm Tuesday through Friday and 10am - 6pm on Saturday. If you would like to see a list of our offerings or place an order please visit our regional order page by clicking HERE.